A desire to position itself at the forefront of healthcare payment reform and be a catalyst for clinical redesign are two factors driving Brooks Rehabilitation's participation in Model 3 of CMS's Bundled Payments for Care Improvement (BPCI) initiative. 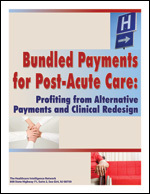 Bundled Payments for Post-Acute Care: Profiting from Alternative Payments and Clinical Redesign examines the four domains of success of Brooks' Complete Care program supporting the organization's bundled payment clinical outcomes and financial results. In this 25-page resource, Debbie Reber, MHS, OTR, vice president of clinical services, Brooks Rehabilitation, shares the inside details of Brooks' Complete Care program and the resulting, significant savings Brooks achieved through CMS's BPCI Model 3, which is limited to retrospective post-acute care (PAC) for select diagnosis-related groups (DRGs). Model 3 includes all non-hospice Part A and B services during the post-acute period as well as readmissions.